I swear the weather can't make up its mind here in Michigan, but I'm definitely ready for fall to officially arrive. I've shaken up my everyday makeup drawers to add in more autumn ready shades. Here's what's now in rotation. Although I love a good dewy finish base any time of year, I'm reaching for a more satin finish as October settles in. The IT Cosmetics Confidence is a Compact in the shade "Light" is creamy and light on the skin while not being so heavy on the shine. It's one of the most buildable foundations I've ever tried and although I was a bit skeptical over the packaging at first, there's a ton of product in there. Plus the compact makes it a lot easier to add more coverage on the go. I've began a love affair with powders that I never thought would ever happen. It seriously helps that I'm no longer caking it on. And in an effort to reduce the glowy skin to more fall-like proportions, powders have been my best friend. Lately I've been enjoying the IT Cosmetics Bye Bye Redness Powder in "Transforming Neutral Beige" to help reduce the Rudolph qualities of my nose. It's light on the skin and gives my concealer a little extra help in staying place and hiding just how little sleep I got the night before. When the first leaf falls to the ground I find myself eyeing up my darker blushes. Thankfully blush is one thing I don't have a heavy hand with so I'm not piling on too much of Revlon's "Wine Not" or Urban Decay's "Video." The UD blush is much lighter and natural looking on the skin while "Wine Not" is meant to make a serious statement. I don't know what it is about colder months that makes me want to whip out all the glitter eye shadows. Maybe it's because I'm bringing down the glow in my foundation that I need to ramp it back up with my shadows? Stila's "Kitten" is my go to, but if I'm feeling just too lazy to pull out the single shadow, LORAC's Pro Palette has some gorgeous shimmery shades in it as well. Fall demands some gorgeous berry and mauve hues so I'm delivering them with a gusto in the lip department. Clinique's "Grandest Grape" has probably been in my collection way too long, but I'm still holding on to its perfect dark berry goodness. If I want something a little more "everyday" then Too Faced's Melted Lipstick in "Melted Fig" is a great alternative. Plus it dries down onto the lips so it lasts a lot longer than most lipsticks. 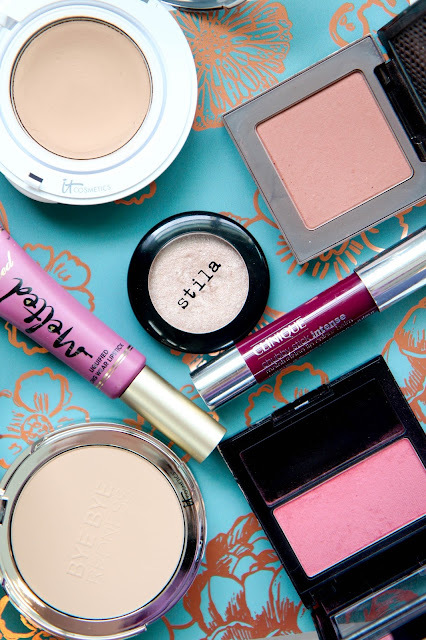 What are your go to fall makeup staples?